Background. In the 1990s, following years of development of meteorological data assimilation by the Numerical Weather Prediction (NWP) community, the data assimilation methodology began to be applied to constituents, with a strong focus on stratospheric ozone (Rood 2005; Lahoz et al. 2007a). Because of its comparatively later application, constituent data assimilation is less mature than meteorological data (henceforth NWP) assimilation. Nevertheless, there has been substantial progress over the last 15 years, with the field evolving from initial efforts to test the methodology to later efforts focusing on products for monitoring ozone and other constituents. More recently, the production of ozone forecasts by a number of operational centres has become routine. A notable feature of the application of the data assimilation methodology to constituents has been the strong interaction between the NWP and research communities, for example, in the EU-funded ASSET project (Lahoz et al. 2007b). A list of acronyms can be found in Appendix. Thanks to R. Dragani, I. Štajner, C. Long, S. Eckermann, H. Eskes, S. Polavarapu and D. Jackson for providing updated information on constituent assimilation efforts at ECMWF, GMAO, NCEP, NRL, KNMI, Canada and the Met Office (UK), respectively. Bouttier, F. and P. Courtier, 1999. 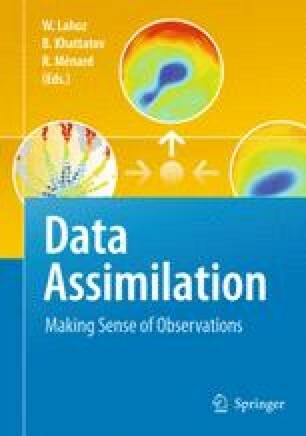 Data assimilation concepts and methods. ECMWF training notes, March 1999. Available from http://www.ecmwf.int. Derber, J., H.-L. Pan, J. Alpert, et al., 1998. Changes to the 1998 NCEP operational MRF Model Analysis/Forecast system. Available from http://www.nws.noaa.gov/om/tpb/449/449body.htm. ECMWF, 2007. ECMWF Newsletter No. 100 – Winter 2006/07. Available from http://www.ecmwf.int. Hollingsworth, A., 2005. Global Earth-system modelling using space and in situ data. ECMWF Seminar Proceedings, September 2005, Reading, UK. Available from http://www.ecmwf.int. IGACO, 2004. The changing atmosphere. An integrated global atmospheric chemistry observation theme for the IGOS partnership. ESA SP-1282, Report GAW No. 159 (WMO TD No. 1235), September 2004; Implementation up-date, December 2004. Available from http://www.igospartners.org/docsTHEM.htm. Lemus-Deschamps, L., S. Grainger, L. Rikus, et al., 2005. Australian UV and ozone forecasting system. Available from http://www.bom.gov.au/bmrc/mdev/expt/uvindex/uvi.shtml. Long, C.S., S. Zhu and R. Treadon, 2007. Assimilation of multiple ozone products into the NCEP operational forecast model. Presentation at the SPARC Data Assimilation Workshop, Toronto, September 2007, abstract available from http://atlas-conferences.com/c/a/u/e/10.htm. Ménard, R., S. Chabrillat, C. Charette, et al., 2007. Coupled chemistry-dynamics data assimilation. Presentation at the SPARC Data Assimilation Workshop, Toronto, September 2007, abstract available from http://atlas-conferences.com/c/a/u/e/25.htm. Müller, M.D., P.K. Bhartia and I. Štajner, 2004. Assimilation of SBUV version 8 radiances into the GEOS DAS. Proceedings of the Quadrennial Ozone Symposium, GOS, Kos, Greece, June 2004. Available from http://ftp://gmaoftp.gsfc.nasa.gov/pub/papers/ivanka/ozone_papers/QOS04.Mueller.pdf. Rienecker, M.M., M.J. Suarez, R. Todling, et al., 2008. The GEOS-5 data assimilation system – documentation of versions 5.01, 5.1.0 and 5.2.0. NASA Tech. Memo., NASA/TM-2008-104606, Vol. 27, 102 pp. Available from http://gmao.gsfc.nasa.gov/pubs/docs/GEOSS_104606_Vol27.pdf. WMO, 2006. Scientific Assessment of Ozone Depletion, 2006. World Meteorological Organization, Global Ozone Research and Monitoring Project, Report No. 50. Available from http://www.wmo.ch/web/arep/reports/ozone_2006/ozone_asst_report.html.